You generally post your resume through email or on website which is just a short summary of your skills, qualifications and work experience, it is not enough to attract the interviewer. To stand out best of all the candidates, you must have a unique version about your abilities and passion towards the job you are going to attend, you must be able to communicate in few seconds confidently without any mistakes. Even if a candidate feels nervous, it is better to overcome it in front of the employer. To create a positive impression on an employer, a candidate need to follow all the below mentioned tips and try to keep all the check points clear while pitching yourself in an interview. 1. Know your goals: You should be very clear about your aims. What kind of a position you wanted to settle and try to match with the company. By knowing the goals of a successful career there is a possibility that a candidate will get a clarity about themselves. There are some of the ways to follow while pitching an employer, and they are as follows. Therefore, it can always help a candidate while pitching himself / herself in front of the employer. 2. Know your skills: Know in which position you wanted to see yourself in the company. Make a clear understanding of how you wanted to grow in your career. How you wanted to serve for organizational and individual growth, Analyze how you would become the key person in the company. A candidate applying for a job should be well prepared for all the questions and situations which might be asked in an interview and to perform easily in every interview, a candidate need to know their own skills and strengths. 3. Career expectation: Let them know by whom you are inspired before mentioning your aims. Mention their name and explain how they inspired you by their successful career and how you wanted to reflect all the ideas on career. Every single candidate applying for a certain job must be having some kind of career expectation. Therefore, it is necessary to understand our own career expectation before expecting from those companies. 4. Keep a professional approach: Do not mention your personal life goals, like you wanted to pursue education or wanted to move on to foreign or wanted to build a house. While answering an employer it is necessary that a candidate need to keep a positive professional approach towards the company. Whenever a candidate approaches the employer try to maintain a distance with appropriate posture which can help an employer to judge your personality. 5. Skills recognition: You can just make a short note of soft and hard skills at which you are best. Tell them about one’s certified skills. You must have joined some institution to pursue some soft skills. Mention about the certification, and make them understand why you want to have that certificate. It is not important that an employer need to be sure of the skills he/she is looking into a candidate, but it is very important for every candidate to be sure of his / her skill which can favor them at the time of selection. 6. Show yourself as an asset: Elevate them so that your skills might be an extra advantage to grab position. Understand the job role and organization services. Analyze how what skills you have that relate to the role. In case if you have experience in relevant field do not forget to highlight them, they may be favorable to occupy the position, present yourself in a way that the employer should rethink about the refusal of a candidates offer. It is possible that the employer may rethink his / her decision over this rejection. 7. Be honest: Do not mention skills which you don’t possess, do not lie if you do not pursue that skills, be honest with whatever skills you seek. Try to be truthful to the employer and present yourself as a person who holds so many degrees without any proof. Therefore, it is necessary that to understand about the company policy which presents zero intolerance policy. Therefore, a smart way of displaying skills can create a process which will be taken as a positive element in the selection. 8. Abilities and weakness: Only mention optimistic points about your strengths and weakness, the employers reads your mind with these answers. Let them know that you are hardworking, pessimist, self motivated, Self confident, and can mingle with others very quickly all these points will attract the interviewer, since it is very much needed in a workforce culture. Always publish at what you are best. These points will be added advantage for your interview. The employers check how well you can perform in team and fit in the work atmosphere, and motivate yourself to work. 9. Present positivity: When a person who is a candidate feels down about themselves and when their efforts are not successful, these types of answers doesn’t make the interviewer to point out or flaw with your answer. This type of answers may impress the interviewer, it is a weakness, but it shows how hard you can work and try for good results. Therefore, it is necessary to have a positive approach in all the professional matters. 10. Analyze about the company: Go through the company profile before attending interview. Mention how good company is performing, study about the company, Understand on what purpose the organization has been established, how do they differ from their competitors, know about the founders and leadership team of the company, how it is structured. Do not attend just for the sake of trying a job. Therefore, analyzing company detail can bring an extra credit point in the selection process for the particular position. 12. Give them a reason to hire you: Do not be over confident about yourself. Let the employers know how you are more unique than others. Show them that how much you are excited to work with the organization. Read the company requirement and let them know how you meet their preferences. Explain how good you fit into their company. Brief them how smart you can handle the work you were assigned by utilizing all your abilities, show your confidence to grab the vacancy. 13. Demonstration of abilities: Elevate How your skills, qualification and experience will help the company, these are added advantage which will excite your employer. How will you serve the company with your hard and smart work, estimate and surprise the company by the way of that culture when you answer and nail it with most positive impression. Demonstration of abilities can be considered as a strength which is very necessary for the success of the company. 14. Do not publish your Flaws: An Interview reveals your stability to work with a company, do not show your work experience where you worked for less period, this hints the interview to doubt your instability. If a person or a candidate presents his / her qualities in front of the employer then there is a possibility that an employer may consider his / her application. Publishing some kind of professional flaw in the name of honesty is a stupid thing to do, and it is better to try to display flaws in the form of a strength or benefit. 15. Never demand expected salary: Do not say how much amount of salary you’re expecting, instead of answering ask them how much they want to offer, do not bargain for salary, do not say an accurate number, if you say less than they offer, you will lose opportunity what you’re worth for, they may offer you more by seeing your abilities so do not open up. During an interview process sometimes the employer might be interested to know your expectation about salary, but it is always better that instead of answering such question, one can wait for their offer. 16. Long term business: Always say that you wanted to work for long term and settlement in company, as long as his / her skills, hard work helps them with organization goals, the company will surely appreciate his / her work and provide a good working environment. This attracts the employer as you yourself are motivated and committed. It is very common that all the companies prefer such candidates who are willing to keep their business with the company on a long term basis. 17. Explain your professional dream: Do not mention about the goal or aims which do not correlate with company, every individual have their own interests other than the relevant field, do no talk about them, this wastes time and employer will be confused that you may shuffle to your interest, it will question your stability. Whenever an employer asks some kind of questions like where you see yourself after 5 years, then try to answer them taking professional growth in mind. And explain all the professional elements about the dream you need it to be fulfilled after 5 years. 18. Be clear about department of work: Do not say that you choose a wrong graduation stream, sometimes your education stream and job role you applied might be not relevant, show your passion towards the job you choose. Sometimes it happens that a candidate might have an education or qualification of an accountant, but because of some kind of a desperation he / she might have applied for marketing department which is a total opposite from the stream of his / her qualification. 19. Content must be concise: Give a zest about yourself, do not elaborate, your introduction must be very short and simple, the employers should be able to test all your skills. Do not explain about your resume, talk about other skills of yours, always remember resume does not explains your passion or aims, so let them know other than mentioned in your resume. Your story should be ideal, to attract the attention of your employer. 20. Be confident: Just remember how you’re good at, why you are here, highlights of your career. Presence of mind is important when you walk in, focus on what purpose you choose the job. Never be afraid of something such as group discussions or personal interviews. An employer expects a candidate who is comfortable enough in any kind of task. According to recent development in business market, it is necessary that a person should at least be good at his / her communication skill which is the only requirement that all of the companies are expecting in their candidates. 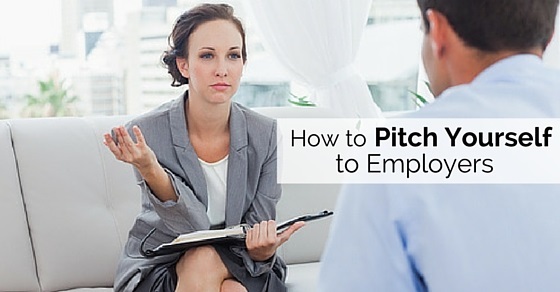 Rehearse your pitch before attending interview. Remember do not mug up and keep explaining a story, answer the employer if he wanted to ask questions in the middle of your zest. Make your content short. Do not mention that you wanted to achieve something else apart from this job. Only highlight what you’re good at. Maintain eye contact when you’re talking about yourself, do not forget to smile, your pitch must be perfect and natural. Let them know you’re flexible with work benefits and pay. Therefore, we would conclude suggesting that all the candidates should follow the above mentioned steps while pitching yourself in front of the employer and be confident while delivery your presentation to the employer.